Best practice is for early openers and last closers to always come and go from the premises as a buddy team. Even if this is your current policy, there will be instances where someone will arrive first or leave last alone. If so here are some tips to keep in mind. Ideally, the parking closest to your entrance is well lit and not encroached upon by foliage and structures that rob you of a wide “visual horizon”. Be sure to lock the exterior door as you enter the building and the door to your office as an added precaution if you so choose. Call a designated person and let them know that you have in fact arrived safely. If you have no designated “call out” person, it would not be relevant if no one heard from you? If you get a ride to work, ask the driver to wait outside until you confirm you are in safely. A male companion may want to walk you to the door. If you feel uncomfortable for any reason call the police ask them to send a car by your office. Always honor your instincts! If you did park further out and will be closing late, move your vehicle closer to your buildings before it gets dark. 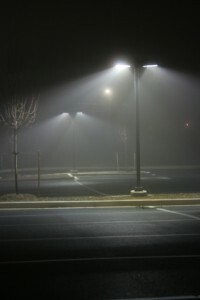 If you know you will not be able to see 100 feet around your vehicle after dark, find a better parking space. While it is still dark out, be sure that the window coverings are pulled closed. This is especially important for offices on the ground and lower floors. Criminals focus in on the unaware as well as the highly predictable. Remember to occasionally vary arrival and departure times, as well as your routes to and from work. Walk with purposeful stride and spend as little time as possible in or around the vehicle. Scan your surroundings and project an alert and “heads up” image. A “small”LED flashlight is helpful for a quick glance around, under and in your vehicle. Leave your hands as free as possible from packages and bags. This gives you the best chance of defending yourself making you a less desirable target. Lock your door, leave immediately and call your contact person and let them know you are in your vehicle and underway safely. This entry was posted on August 29, 2009, 10:24 pm and is filed under Employee Safety, Human Resources. You can follow any responses to this entry through RSS 2.0. Both comments and pings are currently closed.